Based on a true story, Paseka: A Little Elephant, Brave is the incredible story of an orphaned elephant calf. Based on a true story, Paseka: A Little Elephant, Brave is the incredible story of an orphaned elephant calf. Having escaped the poachers who killed her mother, Paseka now faces other dangers in the African savanna. But when she mistakes a safari jeep for her mother, the miraculous happens. Even once Paseka discovers its a jeep, she keeps following it, right into camp! There, humans transfer her to an elephant rehabilitation center where brave little Paseka finds a new family. 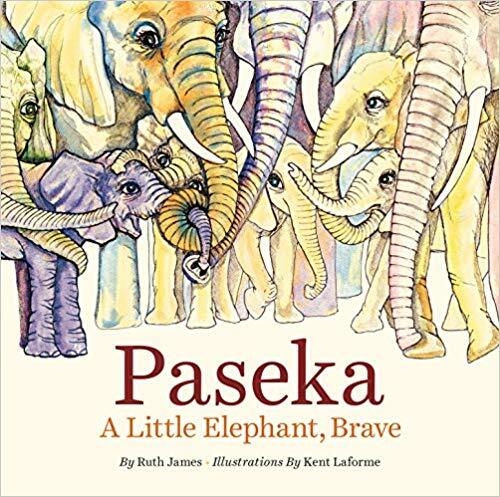 Author Ruth Jamess involvement in the African Childrens Book Box Society (www.africanbookbox.org) inspired her to write Paseka. Through the society, portable libraries of African literature in Book Boxes are distributed to local schools, primarily in Tanzania. Told from Pasekas point of view, the story raises important issues about the interaction between humans and wildlife, and our role in its protection and conservation. It also encourages empathy, so often the catalyst for positive change. While written to create African literature for African children, the books relevance is universal. We could not wait to read this very special book that tells the tale of Paseka, an orphaned elephant calf in Bostwana and her journey of survival. We visited Botswana three years ago and the country is beautiful and works so hard to protect their wildlife. Despite this, you still have people that poach animals. This story is beautifully written, it is honest without being frightening for a child but it is also full of emotion. Paseka is left without her mother and we feel her pain as she tries to find her in the beginning of the book not knowing she was already killed. She encounters dangerous enemies in the wild and then once again meets up with humans. She is not sure if they are there to hurt her or help her. Paseka is transferred to an elephant sanctuary where she will either be accepted into a new family or not. Elephants are beautiful, magical creatures. I will never forget the awe we felt as we were driving through Botswana and they would appear on the side of the road. My heart hurts to think of how any person could harm an animal but yet we witnessed it first hand as we visited sanctuaries. This book is so important to engage children at a young age in animal protection. We need to ignite that flame of caring, compassion and working to protect and save our wildlife. The book is honest, full of emotions and hope for a better future. This is a truly special book with inspiring illustrations. We loved reading it together and it has found a special home in our library. Ruth James is a former school teacher who loves childrens literature. She is a director on the board of the African Childrens Book Box Society (www.africanbookbox.org). The society, which began as a literacy project in Kenya, now works mainly in Tanzania, providing portable libraries of books by African authors to schools that have few storybooks and even fewer featuring African children. It was during a visit to Africa that Ruth met Paseka, the little orphan elephant, and was inspired to share Pasekas story with children.